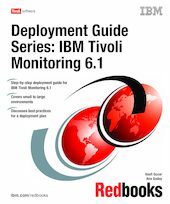 This IBM Redbooks publication focuses on the planning and deployment of IBM Tivoli Monitoring Version 6.1 in small to medium and large environments. The IBM Tivoli Monitoring 6.1 solution is the next generation of the IBM Tivoli family of products that help monitor and manage critical hardware and software in distributed environments. IBM Tivoli Monitoring 6.1 has emerged from the best of the IBM Tivoli Monitoring V5 and OMEGAMON technologies. Integration of these products makes a unique and comprehensive solution to monitor and manage both z/OS and distributed environments. IBM Tivoli Monitoring 6.1 is easily customizable and provides real-time and historical data that enables you to quickly diagnose and solve issues with the new GUI via the IBM Tivoli Enterprise Portal component. This common, flexible, and easy-to-use browser interface helps users to quickly isolate and resolve potential performance problems. The target audience for this book is IT Specialists who will be working on new IBM Tivoli Monitoring 6.1 installations.